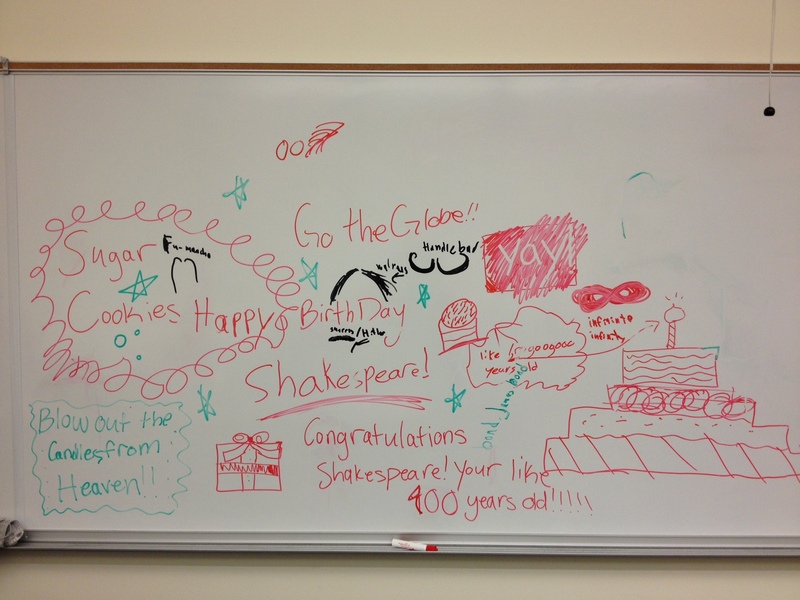 Yesterday, our Shakespeare Workshop celebrated a very special day – the 449th birthday of William Shakespeare…as well as his 397th death day. Well, at least we think it was his birthday. Although it could be today, as Shakespeare was baptised on April 26, 1564 – and back then, baptisms usually took place 2-3 days after the child was born. So…we grabbed some cookies and celebrated! That’s right – birthday wishes, mustaches, and James Bond references (hey, he was English) all rolled into one! That said, we hope that you will be in a festive mood and help us celebrate next week as we perform A Midsummer Night’s Dream on Friday May 3 at 7:00pm and Saturday May 4 at 2:00pm and 7:00pm at First Congregational Church in Prescott! Tickets will be $10 at the door – keep your eyes peeled here and on the The@trics Facebook page for more info! This entry was posted in Blog and tagged 449, A Midsummer Night's Dream, Arizona, birthday, event, family, family friendly, First Congregational Church, live performance, may, midsummer, Prescott, Shakespeare, teenagers, The@trics, theatre, theatrics, things to do, workshop. Bookmark the permalink.